This a sweet liquid that can be put on anything, as well as can be used to create sweet deserts. Runny concoction of sugar and chocolate. It is sticky. It's generally made from; unsweetened cocoa powder, corn syrup, sugar and flavorings such as vanilla extract. Choosing: Choose a bottle that has not expired. Buying: Chocolate syrup is available in all grocery stores and chain stores like Walmart or Target. Procuring: Chocolate syrup is a processed food. Basic ingredients include the following: unsweetened cocoa powder, corn syrup, sugar and flavorings such as vanilla extract. 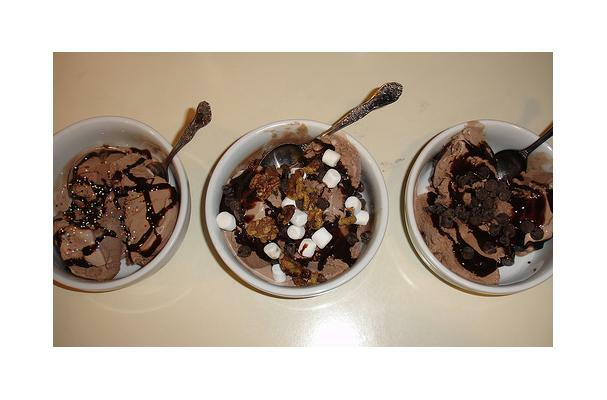 The most common use for chocolate syrup is over ice cream or in ice cream sundaes. Another popular use is for chocolate milk. Cleaning: Wipe with wet cloth the tip of the dispenser and place lid back on. Chocolate syrup generally has a long shelf life. It has an approximate shelf life of 2 years. It will need to be refrigerated after opening. History: Milton Hershey introduced chocolate syrup in 1926.